Description: HoloLAB Champions, a virtual reality (VR) game about chemistry lab practice, provides students with a safe, fun space to practice basic lab skills. Gameplay occurs at a virtual lab desk and uses a virtual lab notebook to guide students in the HoloLAB. They can pour, scoop, spill, measure, break, weigh, and burn, all without making a mess and with the freedom to try again and again. The game has state-of-the-art simulation of liquids and solid powders, enabling students to really feel like they are pouring into beakers or scooping powders into weigh boats. Designed as a virtual reality game show, contestants must finish experiments safely and accurately, with guidance and witty commentary provided by the holographic hosts Earl and Meyer. Players complete a series of mini labs that illustrate standalone basic lab skills, followed by a longer final lab where skills are combined to form a complete experience. There are two episodes in the game currently, and each is designed to last approximately 30-40 minutes. In HoloLAB Champions, students can work together to complete the game’s challenges or they can practice independently. The HoloLAB provides feedback to students on the accuracy of their measurements, their attention to detail in lab procedures, and their ability to avoid spills and breakage in the virtual lab. HoloLAB Champions was created by Schell Games (http://www.schellgames.com) through support by the Institute of Education Sciences (part of the U.S. Department of Education) and the Small Business Innovation Research (SBIR) program. It was developed with input from high school chemistry teachers and students. The game launched on the Steam store on July 10, 2018. It retails for $9.99 USD, but is free for educators. Currently, this Unity game can be played using the HTC Vive headset and hand controls. Starting November 2018, it will also be playable using the Oculus Rift. Skills and Ideas Taught: This single-player game puts the player into a laboratory “game show.” The player will complete a series of mini labs that teach basic lab skills (such as measuring, using a bunsen burner, etc.) followed by a longer final lab where the player combines these skills to complete the experiment. The game is intended to be played individually, either in school or at home; however, special features in the game, as well as a useful classroom guide, help teachers implement the game easily into a classroom setting, where multiple people can participate by guiding and helping the player complete the required tasks. Chemiluminescence: Players mix together the correct amounts of various liquid and solid ingredients to create a solution that glows. Identify Unknowns: Players are presented with a set of unknown substances. They also are given limited amount of reference information regarding these substances. Armed with these tools, players are expected to use the reference information and lab equipment to correctly identify each substance. In the end if they are successful, they create fireworks. 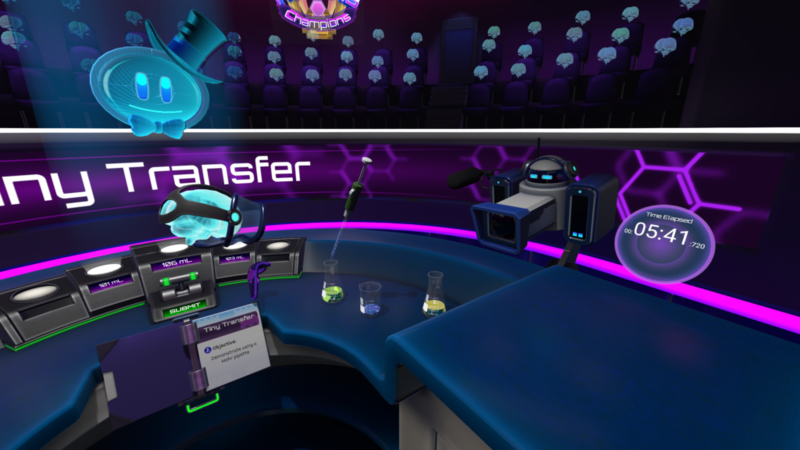 Goal or Challenge: HoloLAB Champions is a virtual reality (VR) chemistry game show, where contestants complete lab experiments to become champions of lab practice. In the game, players interact with materials that replicate the equipment and materials found in a real chemistry lab, allowing them to learn and practice real lab skills in a safe environment. Contestants must finish experiments safely and accurately, with guidance and witty commentary provided by the holographic hosts Earl and Meyer. The goal of the game is to accurately complete the challenges in the least amount of time possible. If successful, the player will be among those featured in the Hall of Brains. Primary Audience: The primary target is high school students between the ages of 14 and 18. Assessment Approach: Performance in HoloLAB Champions is scored along three domains: accuracy, safety, and speed. The player earns an accuracy score, loses points based on safety, and then earns a speed bonus. Accuracy Score: This score is determined by averaging the accuracy of each of the player’s submissions for a lab. The acceptable error varies per lab. At the end of each lab, the player is asked to submit something they prepared during the lab. This submission often includes measuring out some amount of liquid or solid substance. The acceptable error of these measurements varies based on the lab. Spilling substances: -1,000 pts — You can spill liquids and solids if you’re not careful! These spills will be counted against you in your safety score. There is no need to clean anything up; the spill will disappear. If the player spills enough substances so that they cannot proceed, they must pull the “Reload Equipment” pulley to start the lab over again. Breaking equipment: -3,000 pts — Glassware breaks when handled incorrectly, just like in real life. If the player breaks enough glassware that they cannot proceed, they must pull the “Reload Equipment” handle to start the lab over again. Throwing equipment Out-of-bounds: -3,000 pts — Equipment thrown out of bounds of the lab desk will disappear. If the player throws away a necessary piece of equipment so that they cannot proceed, they must pull the “Reload Equipment” lever to start the lab over again. Speed Bonus: Each lab (both mini and final) have an expected maximum completion time. If the player completes the lab before this time, they earn a speed bonus.